In a series of presentations on the Outer Moons of the Solar System, we’ll be looking at the effects of fracturing, volcanism and impacts. Prior to that, we should have a sense of what the surfaces of the Ice Moons actually look like in general. Note that the "ice" of the outer Solar System is really a mix of water ice and ammonia - cleaning fluid - which softens the ice quite a bit. If it was just water ice at the extremely low temperatures of the outer Solar System – minus 270° to minus 170° C – "ice" would be simply too stiff to do half the things I’m going to tell you that ice really does. Here are two views of Europa. Because Europa probably has a subterranean salty ocean under the outer ice, many planetary scientists draw parallels with the ice caps on Earth - especially where Earth’s ice is underlain by ocean water. There’s also a strong indication that Ganymede (left) may have a subterranean ocean - but because of the older age and battered appearance of its surface, parallels with Earth’s ice caps have not been made. As to Callisto (right), it’s so beaten up by impact craters that no-one in their right mind would compare any part of it to Earth. So how realistic is the comparison of the surface of Europa with Earth’s ice caps ? This is an important question because, if the comparison is good, then we have a natural laboratory for Europa right here where we can access it. So let’s take a look at Earth’s ice first, and then you can decide for yourselves by the end of the presentation. We’ll start by looking at Arctic Ice off the North end of Greenland. The two red boxes show where we’re going to zoom-in for the next two images. Here off the NW corner of Greenland - land ice and sea ice behave quite differently. The land ice is apparently quite solid and featureless as seen from an orbiting satellite, which is an appropriate height to view Earth ice for this comparison with satellite images of Europa. But the sea ice is quite distinctive. We can clearly see that it has fractured and broken into large chunks (icebergs) that are well defined and separated from each other by a matrix of thin ice (greyish). Locally - you can see small isolated black areas that represent open water that hasn’t yet linked up to form channels. When we move to the NE corner of Greenland we see solid sea ice (North) with local cracks – plus large pressure ridges localised to the East. What’s clear in this image is that this solid sea ice passes progressively southward through a transition into icebergs surrounded by thin ice and lots of open water. Notice how the cracks in the solid ice are about the same scale as the icebergs that are calved from it to the South. From this we can conclude that the cracks in the ice do not grow in length beyond their original size. This will be an important observation to keep in mind when we look at the Outer Moons. Here’s a similar situation off the coast of Antarctica, to show you that Arctic Ice is not a special case. Again, the land ice is pretty featureless, except for a range of rocky mountain peaks that can be seen as black features just below the “Land Ice” label. This image gives a very high definition look at the nature of the solid sea ice as cracks progressively open (or dilate) to define what will eventually become icebergs. This network of cracks resembles a “fishnet”. Here’s a slightly different version of the same crack network in the Antarctic sea ice, but this time the cracked ice has flowed - so that the fishnet structure has a swirly appearance to it. Despite this further deformation of the crack network - none of the cracks has noticeably increased in length compared to its original state. Now, with this rapid overview of what land and sea ice look in Earth’s ice caps - let’s move out to Jupiter and take a look at the ice moon Europa. The low density of impact craters on Europa tells us that its icy surface is very young and very active. Young ice has effectively erased all evidence of the Late Heavy Bombardment of about 4 Billion years ago. Because of the orbital mechanics of Europa in Jupiter’s powerful gravity field, the moon is flexed like a tennis ball. This generates relatively straight cracks - or fractures - in the surface ice that can be over 1500 Km long. These long fractures are characteristic of Europa (red circle), but so is the “Chaotic Terrain” where the long fractures are distinctly absent (red box - I’ll come back to this in a minute). This is a close-up of Europa’s fractures that shows that the ice along the fractures is different to the ice that the fractures cut across. This tells us that the fractures are actually narrow zones where ice with impurities – probably mostly carbon – was injected from within the moon into the long cracks. So what does the ice that the fractures are cutting across look like close-up ? More fractures ! In fact it’s difficult to find a part of Europa’s surface that is not fractured. The fractures come in different types. Some are discrete simple ridges. Others are more complex and have a central valley down the middle – they're called triplebands or tribands. Some ridges clearly cross-cut others, from which we can work out a time sequence – or a history of fracturing and injection of new ice. In addition to the ridges, there are broad zones with complex shapes and lateral branches - all filled with new ice that itself has an internal structure. This image also shows us a close-up on a localised area of Chaotic terrain (red box). You can clearly see here that the Chaotic terrain cuts or reworks – and therefore is younger than – both the broad zone and the long ridges. Here we see very clearly what this Chaotic Terrain is. It’s a slightly raised area of high ground with a rubbly surface - very different from the ice surrounding it. It either cuts - or sits on top of - all the structure in the surrounding ice, so it’s clearly the youngest thing in this image. In effect, this Chaotic terrain is a gigantic ice eruption – in other words an ice volcano. Note the scale bar : this is a large feature ! How deep do these surface features go in Europa’s ice ? Complex networks of ridges and tribands that cross-cut and offset each other can be interspersed with ice blisters, technically referred to as “Freckles”, which are in fact volcanoes made of "dirty" ice that rose from within the moon. The ridges and freckles avoid each other, as though the one is controlling the distribution of the other. I suggest that either the ridges are deep walls of strong ice that guide the rise of the ice volcanoes, or the ice volcanoes are deep pipes of strong ice that influenced the propagation of the cracks that give rise to the ice ridges. This pattern of ridges and ice volcanoes is also developed on a very large scale. The largest ice volcanoes on Europa are Thera and Thrace. Thrace rises above the Moon’s surface as you might expect, but the floor of Thera sits below the average surface level of its surroundings. In effect, it’s a hole. Intriguingly - in this part of Europa - the ice ridges that the volcanoes cut are curved as opposed to the straight ones we’ve already seen. Now, how does all this compare with Earth’s icecaps ? In the top right of this image from Europa - you can see what some have identified as “icebergs” that they compare to those on our planet. This zone of blocks truncates ridges and tribands and disrupts ice volcanoes that you can see as round blotches. So the blocky terrain is clearly young, and given the absence of impact craters, it’s very young ! Now look at this classical image of Europa’s disrupted ice. These blocks are not icebergs ! They are not separated from one another by a matrix of thin ice, and there are no dilated cracks. Instead, the blocks are in a matrix that has destroyed the ridge structure - that is still visible in the blocks - and the blocks have been shuffled and misoriented with respect to each other. Then, the whole thing is cut by very late long fractures (red ellipse). This is not an analogue of Polar Sea Ice at all; this is a very coarse variety of Chaotic terrain - such as we have seen elsewhere on Europa. In other words - this is the product of ice volcanism (cryovolcanism), something we don’t see on Earth – and certainly not at this scale. If Europa is the type example of a young and active ice moon surface, its sister Callisto is just the opposite. Callisto’s surface is densely scarred with evidence for major meteoric bombardment, and therefore must be ancient. The question is – of course – did it look like Europa in its once active youth ? I don’t know, but that active youth would not have been very long lived because - unlike Europa - Callisto is not differentiated into a core, a mantle and a crust. which tells us that it wasn’t warm enough internally to be active for very long after its formation. This is what we see on the average surface of Callisto : impact craters everywhere. However, there’s something a bit odd about this battered icy surface. Notice how the walls of the craters look like they have been “eaten away” – they are nothing like those of the Rocky Planets. If we focus on the large crater in the red box, you can see that the walls seem to have moved around, even slid down into the crater pit. On the outside of the big crater – to the left – is a smaller crater that has been partially flooded, but by what? The bottom line is that the ice of Callisto’s surface is capable of crumbling and moving around like sand, which is pretty strange behaviour for ice by terrestrial standards. ​Talking of strange behavior, here’s evidence that the strength of Callisto’s icy surface has changed with time. Older craters that are battered by younger ones (centre box) tend to be less well defined than the younger craters, as you can see by looking sequentially at the lower and upper boxes. This suggests that the older craters formed when the ice was too soft and weak to support the pressure difference created by the topographic relief between a deep crater floor and high crater walls, so the craters collapsed – rather like melting ice cream. The younger craters formed when the same ice was stronger – so they’re well formed and preserved. The simplest way to account for this is if Callisto cooled from cold to even colder early in its history, thereby allowing the ice to get stronger with time. Finally, Saturn's moon Iapetus provides us with a spectacular example of mechanical ice behaviour. A giant rubbly landslide of crumbly ice has half-filled a crater that sits within an even larger crater. The cliff that represents the scar the landslide left behind is 15 Km high ! I have to keep reminding myself that this is ice we are looking at, behaving just like rocks do on the Rocky Planets. In summary, the ice surfaces of the Outer Moons are nothing at all like Earth's Polar Sea Ice. On Europa – the classical ice moon – the surface ice features are a mix of fracturing and ice volcanism that is nothing like what we see on Earth. Why the difference ? Probably because Europa’s surface ice sits on a substrate of relatively “warm” - perhaps “slushy” – ice, while Earth’s ice sits directly on water. However, there are those who think that Europa contains a subterranean ocean, but in this model the European ice is much thicker than Earth’s Sea Ice. 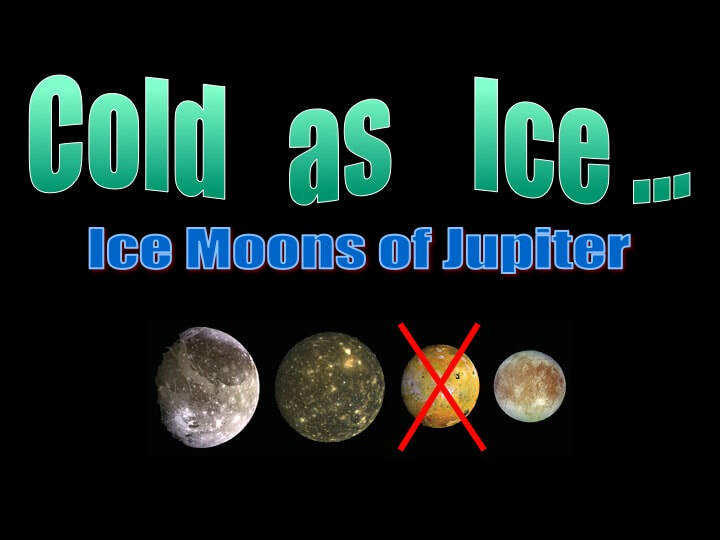 Either way - there's a major difference between the ice of the Outer Moons and Earth's ice caps.